""We came here on the 24th December because we had heard that all the local tribes people would be there for a celebration of the mass. When we got there , there were several thousand people waiting outside waiting - the atmosphere was incredible. We went into the church itself which had been built by the French and which was absolutely beautiful with a wonderfully warm feeling. The wooden structure is quite unique and although we're not in the slightest bit catholic you could sense the feeling of joy from the nuns and children who were dressed as angels for the evening. 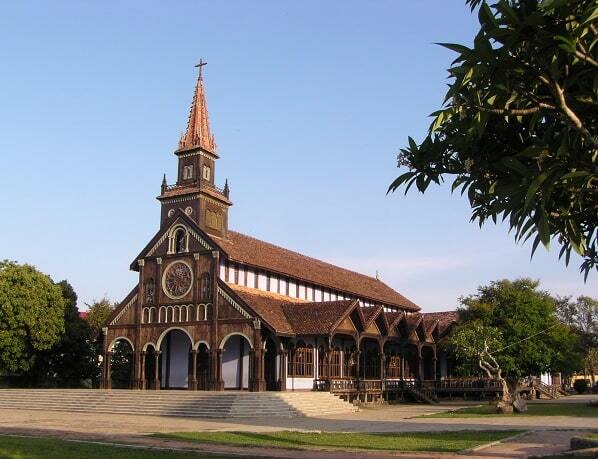 The church is one of the attractions of Kon Tum and well worth a visit." 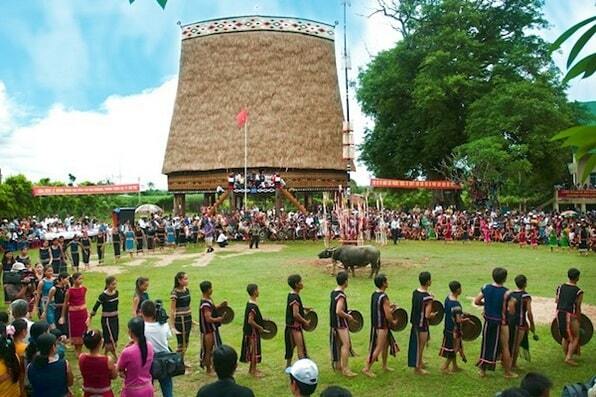 Kon Tum - is the name of the province and the capital, located in the Central Highlands. The capital is a relaxed town with few attractions. What put the province on the map, are the interesting, surrounding villages, inhabited by minorities. You'll find settlements of the Sedang, Bahnar, Jarai, Gieh Trieng and Rengao. Each village has a Rong, a large and impressive community house, where the villagers gather for special occasions. Oddly, the French Catholic missionary work has been very successful in this remote part of the country, causing part of the minorities are still Christian. Kon Tum's main attractions are the villages, home to the indigenous hill tribes (called Montagnards, as the French say). It is highly recommended to go with a guide, because you don't speak the language of the minority and can't communicate with them. So you don't accidentally breaks a taboo. If you're on a tight schedule, it is good to book a tour in advance, because these excursions are often fully booked. Although some of the Bahnar villages are in the east and west of the province, the villages which are further away, are more interesting. Highlights are the different types of the Rong, the cemeteries of the Jarai and joining in a rice-wine party with the locals. The province of Kon Tum consists of about 50% jungle. It contains valuable timber and rare birds. The soil of the province is suitable for growing rubber, coffee, tea and sugar cane. The province has 26,000ha grassland, which is in good condition for keeping cattle. Kon Tum attracts relatively very few visitors because it is quite mountainous. The provincial capital is located on the banks of the river Dakbla. The city has a wooden church, built in the Romanesque style with elements of ethnic minorities. The church was built in 1913 and was completed in 1918. On the grounds of the church is inter alia an orphanage and a workshop with art. Scattered throughout the grounds are artistic images made from tree roots. The river promenade especially invites you for a walk in the evening. The inhabitants of Kon Tum therefore make also in the evening their stroll along the promenade, which gives a pleasant crowd. If you're thinking about a cold beer, this is only available in the restaurants across the road. Once you have a beer on the promenade it turns to be lukewarm. So you can drink your beer the best across the road at the restaurant. Kon Tum Museum is a fairly small museum, but it has very informative displays that focus on the local ethnic minorities (costumes, some traditional occupations etc) with information in English and Vietnamese languages. The quality of the English language used is very good, which incidentally is not great at all Vietnamese museums. The rest of the museum has focused on animals that once lived in the area, minerals and topography. It is worthwhile to visit the museum when you have half an hour into Kon Tum. At 40 kilometers from Kon Tum is the battlefield of Dak To. Here fought the American and the Vietnamese troops against each other in 1967 and 1972. In the town of Mang Den, 50 km from Kon Tum, are spectacular waterfalls, and it's known for its temperate climate and chalets. This area is located at an altitude of 1100 to 1400 meters and is covered by vast coniferous forests. 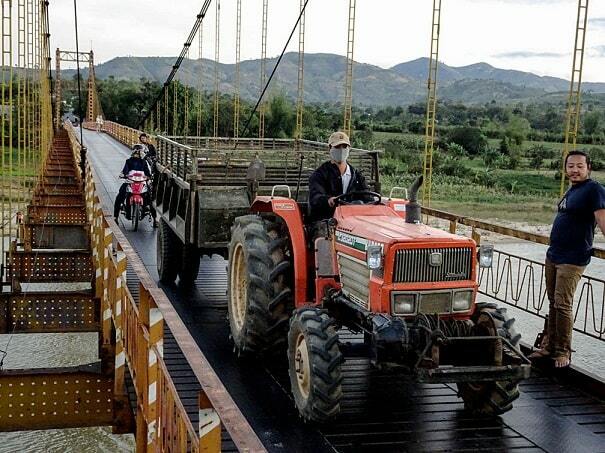 Kon Tum is 246km from Buon Ma Thuot, 215km from Quy Nhon, 49km from Pleiku. The rainy season is from April to October and the dry season is from November to March.